Today in Royals Insider, we proceed to our next first baseman, the frustratingly ambiguous Ryan Shealy. Perhaps the "unknown factor" is higher for Shealy than any other member of our 40-man roster. Why, you ask? Well, after showing years of promising in Colorado's Minor League system and for two months in late 2006, Shealy's offensive production plummeted dramatically last year, leading many Royals fans to seriously question why we should keep him and implement him in a similar fashion next season. Perhaps some of his drop was due to injury, but I digress. Like our previous four articles, we must begin with (where else?) the beginning of Shealy's career. In 1998, the Colorado Rockies originally selected six-foot-five first baseman Ryan Shealy out of Cardinal Gibbons High School, in Fort Lauderdale, Florida in the fifth round of the amateur entry draft. However, Shealy never signed with the Rox, deciding instead to attend the University of Florida in his home state. By his junior year at UFL, Shealy had developed into a bonafide power hitter, drilling 23 home runs and 80 RBI's in 65 games. That was enough to catch the attention of new Rockies General Manager Dan O'Dowd, who selected the six-foot-five first baseman in the eleventh round of the 2002 draft in June. In his first half season with Casper, the Rockies Rookie League affiliate, Shealy hit .368/.497/.714 in 231 at-bats. After getting promoted to the Visalia Oaks in 2003, the statistics regressed somewhat (.299/.391/.519) but then surged ahead once again in AA Tulsa (.318/.411/.584). Shealy had demonstrated fantastic plate discipline, power, and surprisingly good fielding at first base before being promoted to the Colorado Springs Sky Sox in 2005. After hitting a robust .328/.393/.601 (artificially inflated by the thin Colorado air, mind you), Shealy appeared more than Major League ready. In fact, the Rockies held every reason to believe Shealy could contribute as a true force at the big league level. However, one slight problem arose for Ryan Shealy: Todd Helton. Yes, Shealy had indeed become a victim of circumstances in Denver, getting stuck behind perennial All-Star and "face of the franchise" Todd Helton at first base in the organizational depth chart. would definitely keep an eye on him." Unsure of where to allocate their talent, the Rockies temporarily experimented with Ryan Shealy in the outfield in Spring Training 2006, playing alongside equally talented and newly established stars Brad Hawpe and Matt Holliday. Manager Clint Hurdle said Shealy would play primarily in right field at Coors if left-handed hitting Brad Hawpe was not in the lineup. However, an elbow injury - which would eventually suggest further sinister instances - emerged, forced the Rockies to sideline the 27-year old and move him back to first base. how he'll handle advanced breaking stuff. Also, note the age. Shealy would then spend most of early 2006 in AAA Colorado Springs, predictably raking for the Sky Sox (.919 OPS in 58 games). Where art thou, Ryan Shealy? 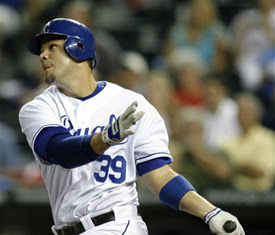 Then, seeing that the promising young power hitter would likely never receive a chance in Colorado, new Royals General Manager Dayton Moore proposed a trade offer that enlightened many Royals fans. The Royals would trade declining (and consistently whiny) left-hander Jeremy Affeldt and talented but brittle righty Denny Bautista to Colorado for Ryan Shealy on July 31. Royals fans overwhelmingly applauded the trade, and Shealy would proceed to produce respectably in a Royals uniform in the final two months of 2006, hitting for a .789 OPS in 51 games for Kansas City. Shealy suffered nagging hamstring injuries in 2007, which limited him to 86 games, split between Kansas City and AAA Omaha. In Omaha, Shealy would show glimpses of the power he possessed for the Colorado organization, but overall, fans became increasingly frustrated with Shealy's depleted run production. Although Shealy was still acceptable (and actually quite good, considering his range factor) at first base, Shealy hit a meager .221/.286/.308, striking out a soulcrushing 53 times in 172 at-bats. For a player one year into the prime of his career, those numbers represent how far Shealy's star had fallen. Throughout his Major League career, Shealy has shown an uncanny ability to hit right-handed pitching (.305/.361/.461, 2007 included), but has never hit lefties (.153/.248/.229 is unacceptable even for a player of his talent). Shealy's a swing-and-miss hitter with enough plate discipline but not enough stamina and ability to stay healthy (injuries have ravaged his career not once but twice). Shealy demonstrates a fine ability to hit finesse pitching (.322/.378/.481) and groundball pitchers (.296/.356/.452), but his future organizations will definitely want to refrain from starting him against notable power (.195/.266/.299) and fly ball pitchers (.186/.264/.335). - Lack of mobility on the field have not affected his first base play (career RF a well above average 8.47 and three career errors at 1B). Unfortunately, I have been down the road of Ryan Shealy before. It seems the Royals have acquired promising young pitchers and hitters all too many teams over the previous umpteen years who have plummeted due to their routine inability to stay healthy (Dan Reichert, Mark "Kung-Fu" Quinn, the previously mentioned Bautista, among seemingly dozens of others). Yes, perhaps it's unfair to hold the misdoings of two previous administrations squarely on the shoulders of "GMDM" but I will consider anything beyond a repeat of Shealy's dismal 2007 performance gravy, in the most extreme of fashions. Shealy is now in his peak season, true, but a season in which players on the upswing peak, not players who merely begin their upswing. I hope Ryan Shealy reads this column and, in turn, becomes motivated enough to get in the best shape of his life, and turns his spiraling career around. However, I will honestly say that it doesn't appear likely. I'm predicting not only a repeat of Shealy's 2007 performance, but a possible midseason release. I'm afraid K.C. fans are stuck with another season of Ross Gload at first base, with that promising but ambiguous young(?) first baseman waiting helplessly in the wings.